A walk in the woods will change a child’s life. That is, if she ever makes it to the trailhead. This week, President Obama unveiled the “Every Kid in a Park” initiative to connect children and their families with the great outdoors, ensuring millions of kids, regardless of where they live, will have an opportunity to take that first step in nature. The initiative will provide free entrance to our nation’s treasured public lands for every fourth grader in America — oh, and they can take their families, too. This initiative matters, because not every kid has a forest in her backyard. In fact, most don’t. More than 80 percent of America now lives in urban areas, and this number grows every year. Opportunities to enjoy and explore nearby nature are limited for many children. Fewer than half of all kids in the United States can safely walk to a park from their home, and school testing priorities and funding cuts are reducing opportunities for physical education, recess, and field trips. Fears about playing outdoors affect how children spend their free time. And today’s youth are able to keep themselves contented indoors with television, video games, and computers; they’re clocking about fifty-three hours of screen time each week. The barriersto spending time in nature are high, and they’re even higher for low-income communities. President Obama understands that not all kids have the same opportunities to connect with nature. Whether or not a child will climb a tree, run through a forest, roll down a hill, or splash in a creek depends a lot on where she grows up and the values and interests of her parents, teachers, and the other adult figures in her life. Last October, President Obama knocked down one roadblock to getting outside by increasing close-to-home access to the outdoors, or nearby nature, for nearly 15 million people living in Los Angeles County. When the president established the San Gabriel Mountains as a national monument, he said “too many children in L.A. County, especially children of color, don’t have access to parks where they can run free and breathe fresh air, experience nature, and learn about their own environment.” With the San Gabriel Mountains designation, President Obama protected 346,177 acres, providing improved outdoor recreation opportunities for millions of kids and families. President Obama’s “Every Kid in a Park” is the latest in a series of barrier-busting moves he’s made to increase access to nature for all. The initiative will provide fourth graders across the nation an opportunity to visit America’s great outdoors free of charge. To support “Every Kid in a Park,” the National Park Foundation will expand its Ticket to Ride program to award transportation grants to schools in need. The initiative builds on U.S. Department of the Interior Secretary Sally Jewell’s youth initiative to get children and youth playing, learning, serving, and working outdoors. And it will kick off at the beginning of the 2015 school year, just in time to start celebrating the 100th anniversary of the National Park Service. As we gear up for the centennial in 2016, “Every Kid in a Park” challenges us to think about the next 100 years. What will the future of our outdoor legacy look like if we don’t make sure all kids have a chance to experience it? The Sierra Club shares the president’s vision. Whether it’s a National Park or a neighborhood park, we’ll do our part to ensure that the next generation has opportunities to experience nature. The Sierra Club’s Nearby Nature initiative supports community-driven conservation efforts, like parks, gardens, and trails, to help ensure that close-to-home access to the outdoors becomes a reality for kids and families across the socioeconomic spectrum. 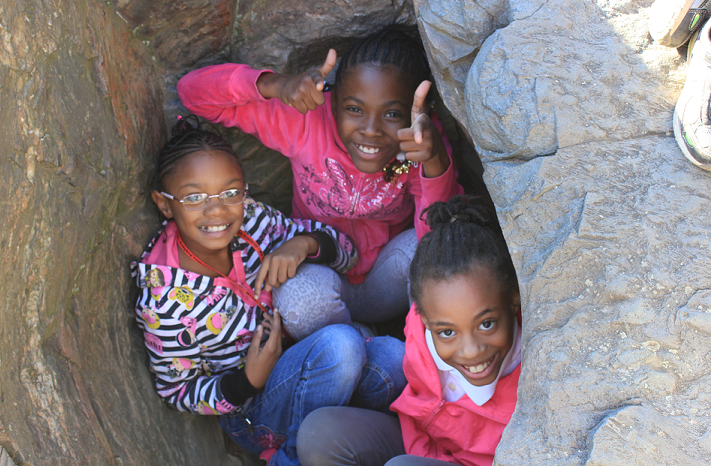 Our Inspiring Connections Outdoors program has been training and supporting volunteer mentors who empower kids to get outdoors for over 40 years and now reaches 15,000 youth each year with nature-based outings in our local and national parks and everything in between. And the Outdoors Alliance for Kids, a diverse coalition of over 75 businesses and nonprofits cofounded by the Sierra Club,supports and will continue to advocate for efforts like the president’s “Every Kid in a Park” initiative that provide quality opportunities for our children to get outdoors. Just for kicks, I googled fear of outside this morning. My search turned up 187 million results. For comparison’s sake, I then googled fear of death and fear of the unknown, fears I thought were fairly common. To my surprise, there were only 84.7 and 73.5 million hits, respectively, and when combined, still fewer results than my first search. While the findings of my quick internet inquiry will probably never hit the annals of any reputable science journal, there is a growing body of evidence that America is becoming increasingly sedentary and spending a lot of time indoors (you can find the facts on the Children & Nature Network’s site). June is Great Outdoors Month, and there is no better time to kick Nature-Deficit Disorder to the curb. So, let me share ten ways to get outside and celebrate the outdoors this month. 1. Get Out-ing. Did you know that the Sierra Club, America’s largest grassroots conservation organization, offers outings throughout the country (and the world)? Sierra Club’s 7,500+ trained volunteers are leading outdoor activities this June (and all year round) for beginners and the most experienced hikers. Find your local Sierra Club chapter or group and join an outing that matches your interests. Being a newly trained and certified Sierra Club outings leader myself, I can personally vouch for the program. 3. Hit the trail with the American Hiking Society. June 7th is National Trails Day®, a time to explore and enjoy America’s trail system. Enjoy a stroll along a city trail or take on a section of the Appalachian Trail. There is no trail too big or small that isn’t worth exploring. 4. Celebrate African Americans in National Parks Day to honor the rich history and contributions African Americans have made to our National Park System. This year,Bay Area residents are joining Outdoor Afro and the National Park Service to pay homage to the famed Buffalo Soldiers by retracing their historic journey from the Presidio of San Francisco to Yosemite National Park. In 1903, units of the 9th United States Cavalry made the 280-mile trek over thirteen days from the Presidio to Yosemite. Buffalo Soldiers spent the summer in the park protecting it against poaching and grazing and blazing trails still used today. 5. June 14th is National Get Outdoors Day. Grab your family or a friend – try to find someone who doesn’t spend a whole lot of time outdoors – and show him or her why the outdoors is so special to you. Start simple at a nearby park close-to-home or go visit a state or national park, forest or refuge and celebrate America’s public lands. 6. Better yet, take your dad, and make it a weekend. June 15th is Father’s Day and there is no better way to celebrate then a weekend outdoors. Skip the wrapping paper and give your dad a gift that he really wants – quality time with you! 7. Pack a lunch and grab your family and friends for a picnic on June 18th for International Picnic Day. Getting outdoors doesn’t have to mean climbing Mount Everest. Spending time outdoors can be as simple as grabbing a blanket and some grub and getting to your local neighborhood park for a picnic. 8. During Great Outdoors America Week, June 23-26th, join Sierra Club, The Wilderness Society, the Outdoors Alliance for Kids and many other groups in Washington, DC, to let your leaders know how much you care about America’s Great Outdoors. Great Outdoors America Week raises awareness around outdoors issues by bringing together hundreds of diverse organizations and activists to meet with lawmakers and administrators to advocate for our outdoor way-of-life. Can’t make it to Washington? Consider meeting with your local decision-makers, or sending a letter to your representatives, to let them know how much you value our public lands. 9. Close out the month by participating in the Great American Backyard Campout(hosted by the National Wildlife Federation) where thousands of people across the nation will spend the night of June 28th outdoors, in a tent or sleeping under the stars. And remember, America’s public lands belong to all of us, so even if you don’t have a backyard right outside your door (and many of us don’t), you can camp in a park near you! 10. Oh, and plan ahead – because opportunities to get outdoors don’t stop at the end of June. Parks and Recreation Month AKA July is right around the corner.